In this tutorial we will learn how to use the AMBER software to perform molecular dynamics simulations at constant pH (CpHMD), one of the most important chemical equilibria in biology. Solution pH affects titratable side chains in proteins (and, on occasion, ribozymes), which can have a dramatic impact on the function, structure, and stability of large biomolecules. CpHMD is a method that uses a hybrid molecular dynamics/Monte Carlo approach to sample conformations and protonation states of various titratable residues in biomolecules. This method can help capture the coupling between protein structure and pH. By Jason Swails and T. Dwight McGee Jr. 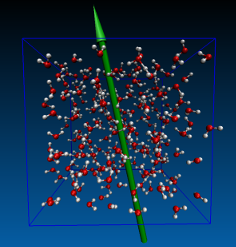 In this tutorial we will explore how to perform constant pH and redox potential (C(pH,E)MD) simulations in AMBER. This method aims at describing electrochemistry experiments performed at a fixed value of redox potential and pH. 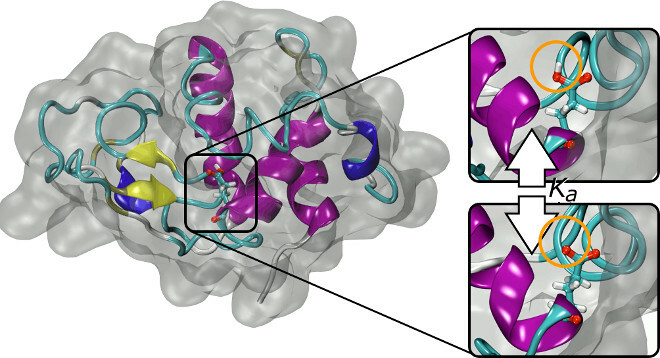 We will perform simulations for N-acetylmicroperoxidase-8 (NAcMP8) axially connected to a histidine peptide. This system contains a single heme group and its standard redox potential (Eo) is experimentally known at pH 7.0. With the use of different simulations for multiple target pH and redox potential values, we will see that our methodology correctly describes some fundamental behaviors: the Eo related to the heme decreases with increases in pH, and the pKa of the pH-active residues decrease with increases in the redox potential. TUTORIAL A2: A simple coupled potential QM/MM/MD simulation. In most simulations, the classical amber force field is the preferred method for defining and navigating an energy surface. Since AMBER 9, however, we have offered the capability to simulate coupled quantum mechanical and Newtonian mechanical (QM/MM) systems. This tutorial demonstrates how to set up a simple QM/MM MD simulation of NMA in solution. This tutorial illustrates the use of steered molecular dynamics and a QM/MM energy to compute the barrier to proton transfer in malonaldehyde. TUTORIAL A30: Quantum dynamical effects in liquid water: A semiclassical study on the diffusion constant and the infrared absorption spectrum. Jian Liu, William H. Miller, Francesco Paesani, Wei Zhang and David A. Case. J. Chem. Phys. 131, 164509 (2009). It is designed for those who are going to run molecular dynamics simulations with quantum dynamic methods, PIMD and LSC-IVR.